Dayco has set the standard for quality, performance and service life for power transmission products used in the industrial marketplace. Ranging from low horsepower machinery to high-output agriculture equipment, Dayco’s Industrial products cover all applications that use belts to transmit power in the industrial, farm, fleet, lawn and garden, construction and oil field industries. 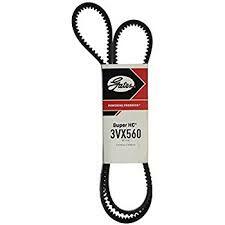 Gates invented the V-belt nearly 100 years ago and remain a leading V-belt manufacturer today.